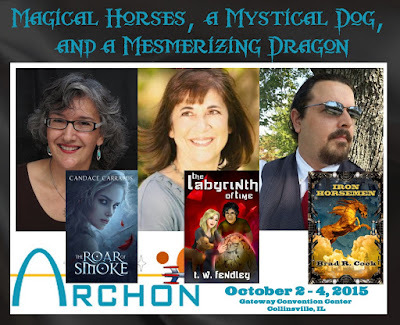 The Writers' Lens: Join us at Archon 39 in Collinsville, IL! This weekend, join Candace Carrabus, Brad R Cook and T.W. Fendley at ARCHON 39, the “Midwest’s premier science fiction and fantasy event,” in Collinsville, Ill. Candace writes about a world filled with magical horses, Brad’s book features a mesmerizing bronze dragon, and a mystical dog takes center stage (actually, center labyrinth) in T.W. 's young adult book.